Gladiolus (Gladiolus) is Latin for “little swords” due to the plant’s long, spike-like leaves. They are striking annual additions to any spring garden due to their long spikes of trumpet-shaped flowers that bloom in a wide variety of colors spring throughout summer. Plants grow and multiply from underground corms and, depending on the cultivar, grow anywhere from 2 to 5 feet tall. Gardeners with limited space will have no problems growing gladiolus inside containers, provided they meet the plant’s requirements. Select healthy gladiolus corms for planting inside your container. Choose corms that are plump and thick over thin and flat as they produce larger flowers and bloom within the first year of planting. Consider the amount of corms you are planting inside the container when selecting the correct-sized container. Plant most varieties of gladiolus corms 6 inches apart, so choose a container accommodating the quantity you are planting. Be sure the container has drain holes in its bottom, as gladiolus will not tolerate living in soggy conditions. Fill the container with a well-draining potting mix and water the container. Dig a hole to plant the corm deep enough for the particular gladiolus corm’s size. Plant the large corms 6 inches deep and apart, medium corms 4 to 5 inches deep and 3 to 4 inches apart, small corms 3 inches deep and 2 inches apart, and cormels 1 to 2 inches deep with the same distance apart. Cover the corms with soil after planting. Situate the corms into the planting hole with their pointed side up and the scar or flat side of the corm facing downwards into the soil. Corms will not grow if planted in the wrong direction. Water the gladiolus corms after planting inside of the container. Allow the water to run from the base of the container. 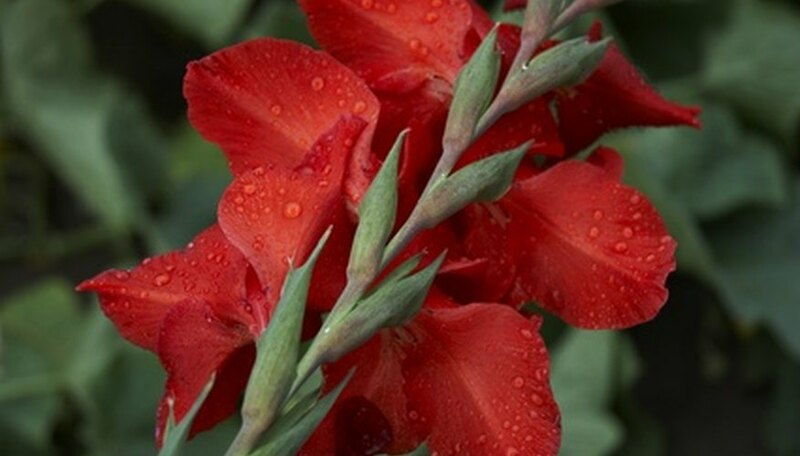 Continue watering the gladiolus regularly with approximately 1 inch of water per week. Situate your container in an area of your landscape that receives full sunlight throughout the day. Gladiolus will perform and bloom best when grown in full sun conditions. The brighter the light, the brighter the flowers and plants are stronger. Allow the foliage to die back on the plant after the gladiolus finish blooming and do not cut back until it has died. The foliage gathers nutrients for the corms to strengthen for the next growing season. Remove corms from the container and store for winter if you live in areas with annual freezes. Gladiolus corms will not survive if left in the ground year-round in USDA hardiness zones 5 or lower. In warmer areas, you may leave corms in the ground year-round. Dry the corms for one to two days after digging and then place them inside of a cardboard box layered in peat moss. Place the box in a cool area inside your home until the following spring when replanting into the container. Shorter cultivars of gladiolus are better suited for growing inside containers over taller varieties.